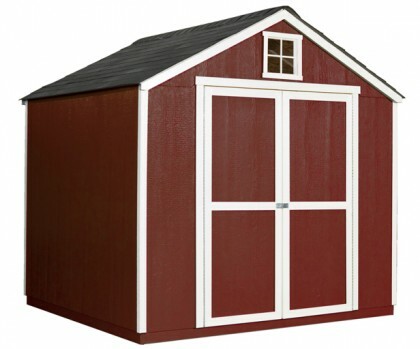 This 8’x8’ shed features engineered wood siding that is well protected from the elements so you can focus on your daily tasks and not on yearly maintenance. The gable window adds a touch of light inside and makes your space feel like home. 6’ tall side walls give you plenty of vertical storage space for rakes, shovels and weed trimmers. Wide 56" double doors make it easy to bring in lawn mowers, small tractors and bicycles when you need it. This storage shed gives you the space you need to do what you do best with plenty of money left over to tackle your next project. Double door opening: 56" W | Height: 69.5"
Your local building authority may have specific requirements resulting in additional cost. Prices do not include painting, staining, permits, zoning and setback advice and/or compliance, excavation, or leveling beyond 6". All prices and content are subject to change without notice. Promotions are valid with online transactions only and cannot be used in conjunction with promotions at a servicing sales/distribution center or distribution center. Not valid on prior purchases. All stated sizes are nominal dimensions and approximate. Some sheds may be shown with optional items. Additional mileage charges (if applicable) and taxes will be calculated after the checkout process is completed. Painted 8x8 shed is a representation only, arrives primed for painting in a light beige color.